Government is working on three agricultural policy initiatives to boost productivity and increase the sector’s foreign currency generation. This was disclosed by Lands, Agriculture and Rural Resettlement Minister Chief Air Marshal (Retired) Perrance Shiri, while officiating at a horticulture stakeholders’ conference in Harare yesterday. 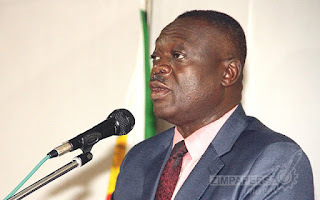 “You may be aware that my ministry is already working on an agriculture marketing and trade policy, the horticulture development policy and the mechanisation and irrigation development policy and has its foot on the ease of doing business peddle,” Chief Air Marshal (Rtd) Shiri said. He added that agriculture was not only necessary to Zimbabwe’s economic recovery but for economic growth and foreign currency generation. “I share with you the common view that agriculture is not only necessary for Zimbabwe’s economic recovery but is sufficient to contribute between 16 percent to 20 percent of the GDP (gross domestic product) and 40 percent of exports while providing a solid source of livelihood to about 67 percent of the population,” Chief Air Marshal (Rtd) Shiri said. Failure to penetrate foreign markets, lack of irrigation and mechanisation and a decline in the horticultural sector had affected the agricultural sector’s contribution to the Minister Shiri said revival of the horticultural sector as a top foreign currency earner was a top priority for Government. “Today we witness tobacco being the leading contributor to agricultural growth. I am convinced that horticulture is a sleeping giant. It is strategic in that it would be a direct attack on poverty, hunger and malnutrition in addition to generating foreign currency and creating high employment opportunities down the value chain. “Historically, the horticulture industry grew rapidly during the 80s and 90s. The industry used to contribute between 3,5 to 4,5 percent to GDP and was second to tobacco in foreign currency earnings. Horticultural exports grew from $3,5 million in 1986 to $32 million in 1991 and reached its peak of $143 million in 1999,” he said. The major reason for growth then, he said, was better coordination through the Horticulture Promotion Council (HPC), minimum regulation, a market-driven production strategy, high profile image on the international markets and good infrastructure and abundant land. “As we gather here today, these conditions are no longer prevailing in the industry. The horticulture sector is now dominated by small-scale production outfits that are dotted across the country and are saddled with technological and skills challenges, inadequate credit lines to finance production hence from a peak of $143 million in 1999, horticulture exports fell to about $72 million in 2005 and $40 million in 2009,” Chief Air Marshal (Rtd) Shiri said. He added that Government was willing to partner the private sector in reviving the sector and provide the requisite incentives for its growth. HPC chief executive officer Mr Basilio Sandamu said the sector was critical in generating export earnings, especially if challenges facing new entrants into the sector were addressed. He said challenges faced by farmers included lack of funds, specialised transport and other equipment. At its peak, Zimbabwe produced 18 400 metric tonnes of cut flowers, 14 200 tonnes of vegetables and 45 000 metric tonnes of fruits. Last year, Germany expressed interest to import 15 horticultural crops from Zimbabwe, a development likely to earn the country millions of dollars in foreign currency, as the demand for organic crops and Biotech-free cotton increases on the international market. Zimbabwe is known for producing uncontaminated crops that are in high demand on the international market. This is expected to boost Command Irrigation and infrastructural development, with farmers having an opportunity to be trained in production and processing of the high-value crops. The crops include high quality okra, peas, beans, cucumbers, chillies, celery, broccoli and lettuce. China has also expressed interest to import citrus from Zimbabwe, and a quarantine delegation was recently in the country to inspect citrus farms to see if they meet the phytosanitary requirements. Phytosanitary relates to the health of plants, especially with respect to the requirements of international trade. The country used to be one of the largest exporters of a wide range of horticultural products in Africa, supplying markets in Europe and the Middle East.